Yellow cards were practically flying everywhere. The announcer was getting bored. The fans and spectators were getting antsy by the extra minute (and bored too). 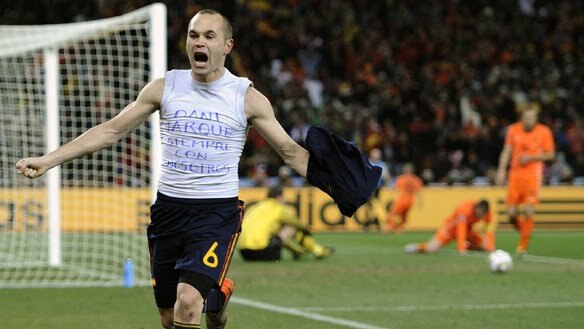 Thank goodness for that much-awaited goal by Andrés Iniesta. You've no idea how absolutely happy I was for Spain to take that trophy this time, this year. They've waited for like, forever, for this moment to arrive lang naman. And they deserved every inch of that 18k trophy. Kudos to Nederlands also, you did your best guys. Too bad you can't get past over the greatest not to mention the cutest, most adorable goalkeeper we have today: Iker Casillas. Ooh I can almost imagine the Spanish celebration. Wait 'til these boys get home. 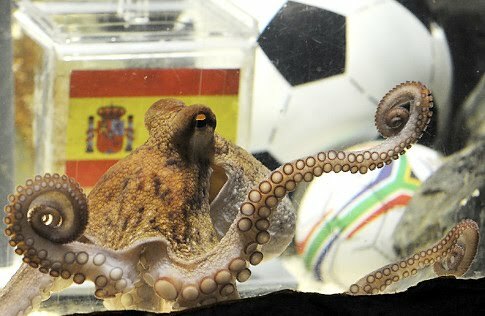 Makes you think Paul the Octopus was right all along. Too bad Dutch fans and others out there were probably wishing you're their dinner tonight. Hey, an octopus' gotta do what an octopus gotta do!